Can community-scale solar become the Model T of clean energy? Every single solar project, big or small, gets assembled one at a time on a roof or in a field. But what if you could pre-manufacture solar projects in a factory, instead? Could you do to solar what Henry Ford did to cars and make solar even more affordable and available to virtually everyone? What is “community scale” and why does it matter? The industry defines solar installations in three rough categories: utility, mid-scale and residential. The mid-scale tier is one of the newest and most exciting areas in solar. It goes by many names including “commercial scale” and what energy “think-do” tank, Rocky Mountain Institute (RMI) calls “community scale.” While the actual numbers vary by location, home size and whoever is doing the calculations, the diagram below shows the broad difference between the categories. Widest set of customers – utility-scale solar has only two kinds of customer – large utilities and giant businesses like Google and Apple. Community-scale fits the needs of a surprisingly wide group of customers including campuses, office buildings, shopping malls, neighborhoods, military installations, islands, shared solar farms for homes without rooftop access, and small, rural utilities (called cooperatives or EMC’s). Easily available land – community solar farms can sit on 5-10 acres of land. Plots this size are widely available, even in suburban areas. By contrast, utility-scale can require hundreds of acres. Plots of land this large are almost always far from population centers and require power lines to deliver the power where it’s needed. High voltage power lines are very expensive and are also the source of the vast majority of blackouts. 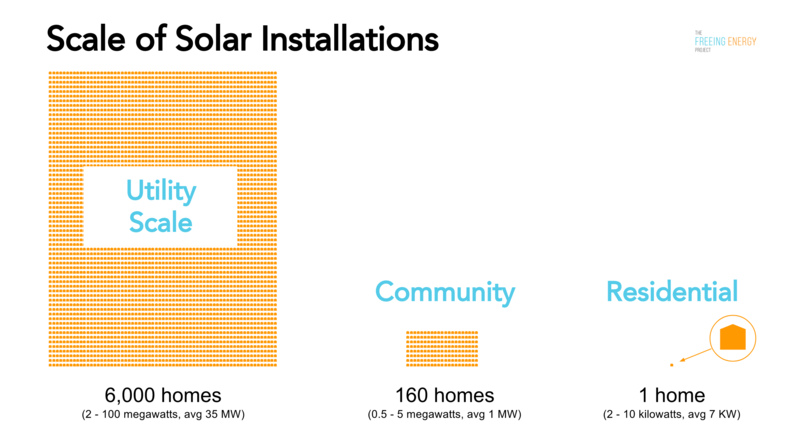 The third and most important benefit of community-scale solar is its potential to be repeatable, scalable and modular... to be assembled like Lego bricks. 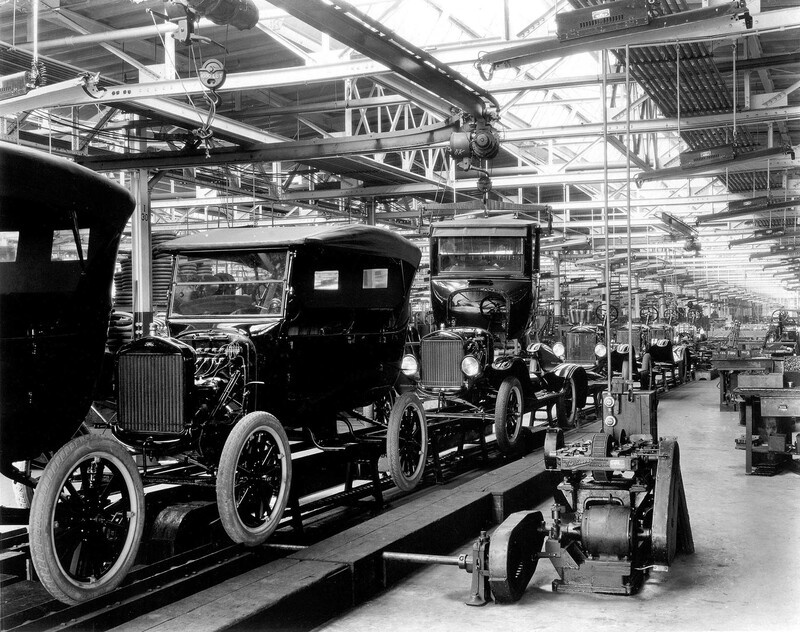 Henry Ford famously said that Model T car buyers could have any color they wanted as long as it was black. This approach of one size fits all is just as revolutionary in the solar industry today as it was back in 1908 when the Model T came to market. How is it that common cars like Toyota’s Camry or Honda’s Accord cost $30,000 to $40,000 but hyper-cars like Lamborghinis can cost millions? Specialized parts account for some of the higher prices but a lot of the difference is mass production. Hand-assembling each hyper-car one at a time is incredibly expensive. Modern solar installations have more in common with Lamborghinis than Camry’s. Every residential solar buyer has a unique roof, unique financial needs, and unique house wiring. Residential installers may be able to use commodity solar panels but everything else is one-off. Every utility-scale solar has unique terrain, complex financing and a particular place it plugs into the grid. Because the scale is so large, it’s worth hiring experts to squeeze every penny from every element of the project. Money is saved but, other than solar panels and inverters, nearly every other aspect of these large projects is a one-off. Most modern community-scale projects are treated like small versions of utility-scale projects. Each bidding process, supply chain, engineering design, site delivery and assembly are completely unique. But they don’t have to be. This is not just a fanciful idea. Some of the smartest people in energy are starting to look at solar, and community solar in particular, in an entirely new way… and it might just revolutionize the industry. Check out my blog on a remarkable gathering that took place in November just outside New York City to explore this very opportunity: Can we make solar installations 3-times cheaper in the next 3-4 years? ← Can we make solar installations 3-times cheaper in the next 3-4 years?